I came across Titan™ which had an interesting line of increased capacity fuel tanks for diesel powered vehicles. 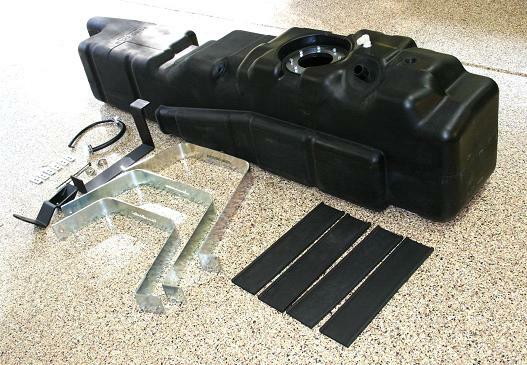 While it is easy to weld up some sheets of metal into a box and call it a fuel tank, it is quite another to design a tank that utilizes every nook and cranny, and then invest in expensive molds to create one out of plastic. Add on top of that, using some of the toughest cross linked poly material in the process. The first thing I noticed was that unlike any other fuel tank, there are all sorts of contours, bumps and curvatures which use every bit of space to increase the fuel capacity. The next and probably most notable thing I discovered is that the new tank is nearly the same exact height as the stock OEM tank. With both tanks side by side it's hard to imagine the Titan tank which is not all that much larger, holding almost TWICE as much fuel capacity! In fact, I did not believe it until I went to fill up after the installation. This is a testament to the time Titan spent in compact engineering their tank as efficiently as possible rather than just making the whole thing bigger, and bulkier. Anyone can do that, but Titan did it the right way. I did the installation outside in the driveway, in the rain, on a cool, fall day with just a couple of hand tools in about 5 hours. While it was not difficult, it does take some time if you are doing it by yourself as I was. The results were truly magnificent! 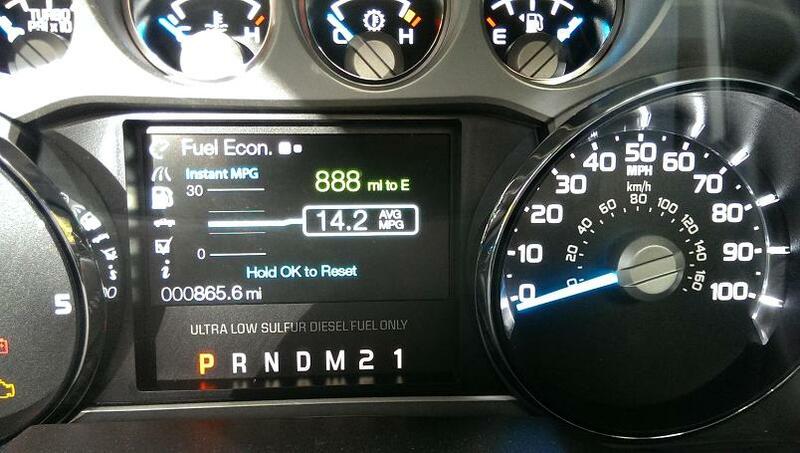 with the new fuel tank installed in the new Superduty, the Titan's increased capacity provides a range of nearly 1,500 miles before needing to refill. I could drive clear across the country and only need to stop for fuel, once! 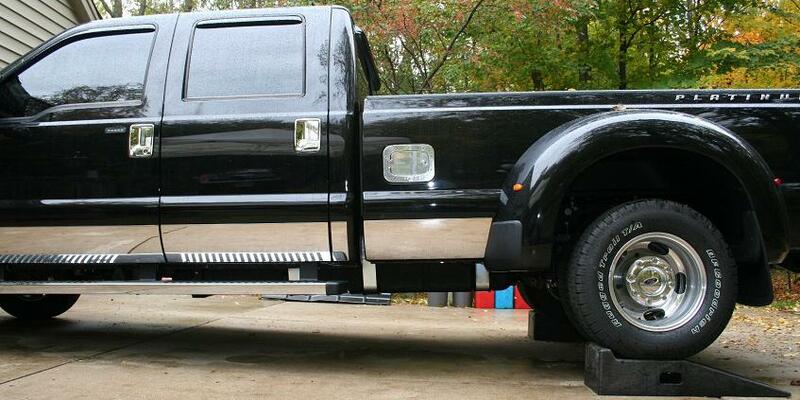 I installed the Titan Super Tank XXL on a brand new 2014 Ford Super Duty dually pickup with an 8 foot bed. 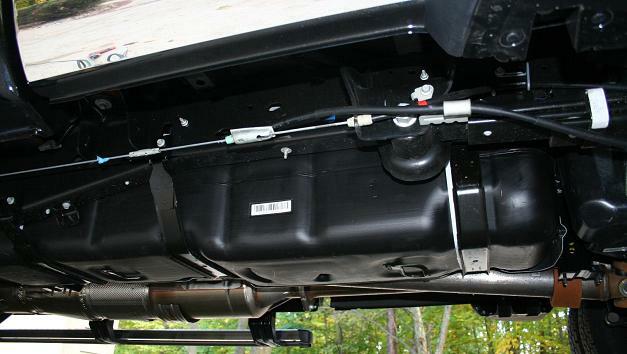 This Titan tank was rated at 65 gallons and directly replaced the stock ford 38 gallon tank. The huge heavy cardboard box the fuel tank arrived in ensured a damage free delivery. 1. First I siphoned as much fuel out of the tank as possible and stored the diesel in spare gas cans. 2. 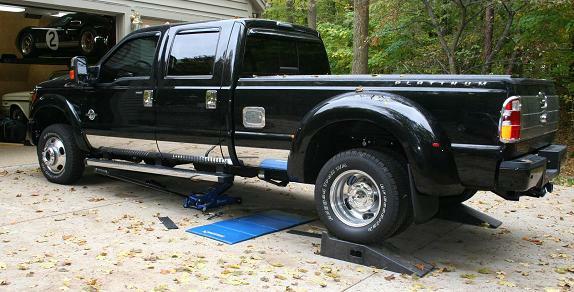 Not having a hoist and installing this is my driveway, I drove the rear of the truck up on ramps, placed a jack under the stock tank with a length of wood to support the tank, and removed the brackets and straps. While lowering the tank, the upper sender hoses and wires were then removed and the tank was lowered the rest of the way to the ground and pulled out from under the truck. NOTE: Even after siphoning out as much fuel as possible, there was still about 5 gallons of fuel in the tank and ironically the stock tank with fuel in it was still lighter than the new Titan tank, empty! That is some super thick heavy duty plastic! 3. Placing the old stock tank next to the new Titan tank, the filler hose was transferred to the new tank, and the vent hose was removed, cut and the supplied "T" fitting and vacuum hose was installed before transferring it over to the new tank. This device prevents the tank from collapsing as fuel is drawn from it. Then the stock sender unit was transferred over where you will notice the bottom of the sender unit and fuel pickup is "telescoping" so it will always sit perfectly at the bottom of the tank. The new center ring bolts were tightened around the sender and need to be retightened after about a half hour. (see below). 4. After placing the new tank on a length of wood and then onto the floor jack, the new tank was rolled under the truck and lifted into place. All hoses and fittings were connected and the tank straps were attached. 5. This 2014 truck just came off the assembly line and Titan did not have a chance to test this application, and I found the strap that attached to the center cross member had to be notched slightly to fit the contour of the cross member perfectly. 6. By carefully bending and reforming the straps you can make the installed height of the strap taller or shorter (tighter), and the width either wider or narrower to better fit the tank bottom. 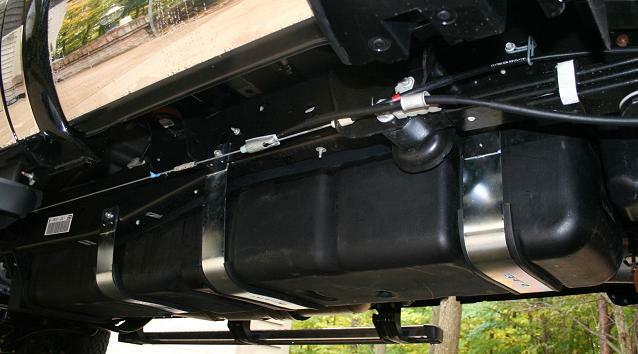 This eliminated the need to use the included shims to be placed under the strap mounting brackets to achieve the correct height so the tank is not too loose, or too tight. I used the leftover thick shims as reinforcements on the strap flanges when bolting them down to the body. 7. Once all the bracket and straps and hoses were attached, pour some fuel in it and drive it off the ramps, and count this project "completed"! that's all there is to it. A. Be sure to tighten, retighten, and re-retighten the fuel sender bolts over and over again as the o-ring and gaskets compress. 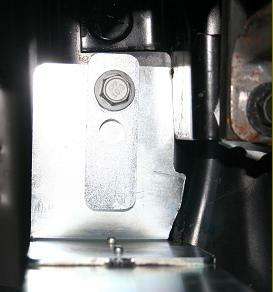 After filling the fuel the filler neck to the cap opening, I had to chase a fuel leak coming from the flange bolts. Using the trouble shooting guide that came with the instructions I found I had to retighten the filler neck bolts at least 5 times... finally sealing the leak. I also retightened all the hose clamps a few times for good measure. Luckily this can all be done with the tank installed, although just barely. It would be better to do this before installation. A. I put in about a 2-1/2 gallons of fuel to get to the gas station where the Titan Super Tank took just a tad over 65 more gallons on board to fill it to the top making the total capacity 67.5 gallons, 65 being usable. Of course now the trip computer's Distance To Empty range was way off only showing 555 miles on a full tank, and the fuel gauge read on "E" even with 5 gallons in the bottom of the tank. So either by going to a Ford dealer or a local repair shop that uses a VCM interface and IDS diagnostic software to access your vehicle's computer, you can get in and select the new tank size which was "65" gallons from the menu. In just a few seconds, the DTE read 888 and the gauge and trip computer was now recalibrated to the new tank size. SUMMARY: The tank fit nicely, installed nice and looks just like factory. 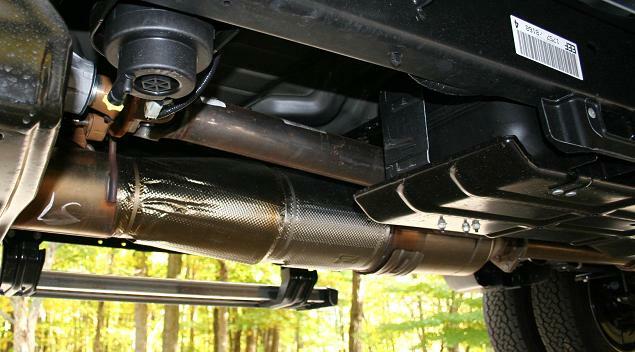 Even better is it does not hang down or look bulky like my previous steel Transferflow tank did. Best of all, no more corrosion, rust, peeling paint and repainting! And this tank is well over a hundred pounds lighter than the steel tank, yet, it looks just like stock! 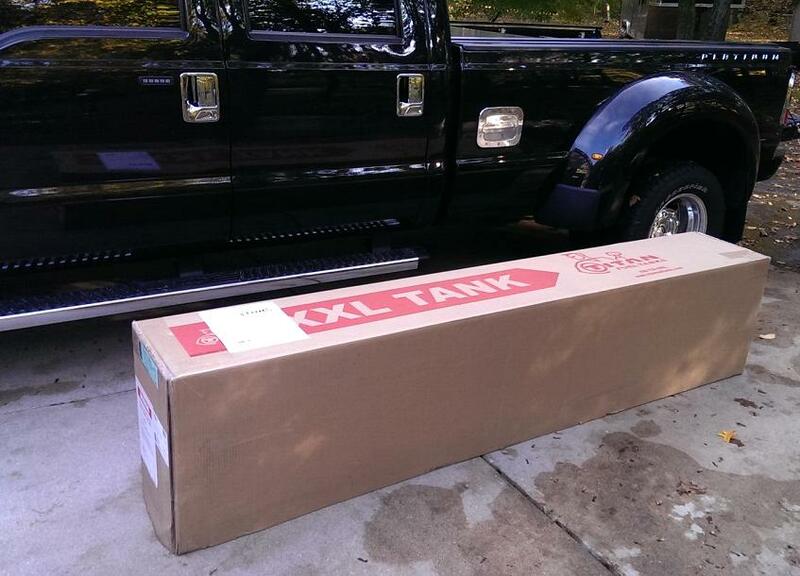 (below) A complete 65 gallon Titan Super Tank package. (below) The stock tank next to the Titan Super Tank. (below) The stock 38 gallon Ford tank is at the top, and the 65 gallon Titan Super Tank at the bottom. (below left) The new Titan tank is rolled under and straps being installed. (below right) The modified center strap mount. 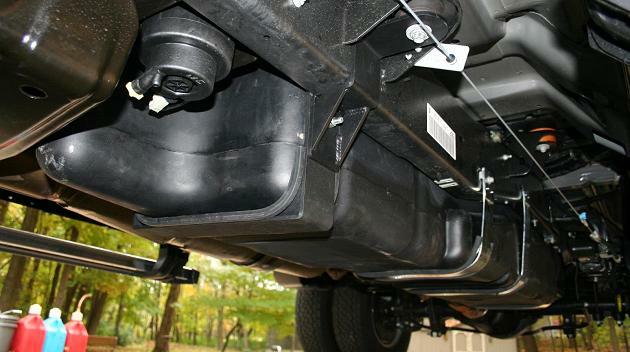 (below) The new Titan tank is completely installed and notice it does not hang down below the running boards at all. 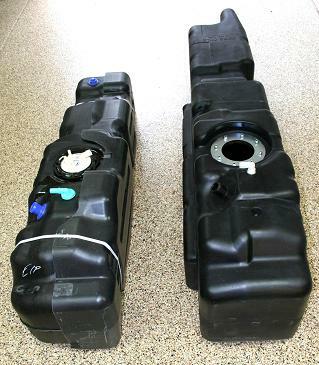 (below) Below is The old stock 38 gallon tank with it's plastic side guards. 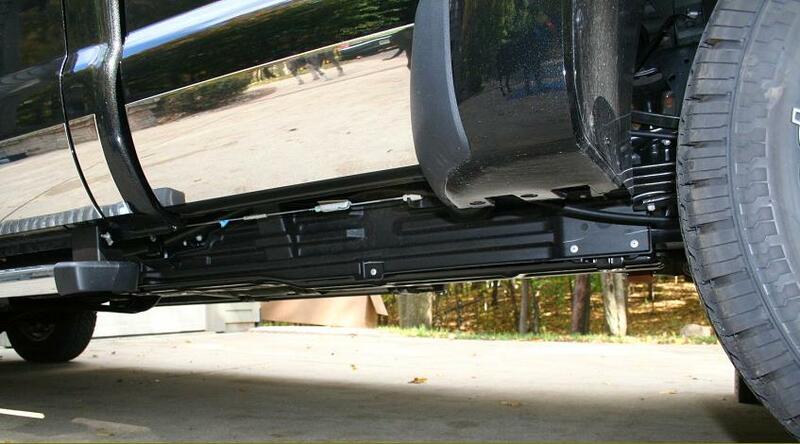 Notice how it is also even with the running boards. (below) The new 65 gallon Titan Super Tank XXL in place and ready for duty. (below) The old stock 38 gallon tank. Note the unused space in front of the stock tank. 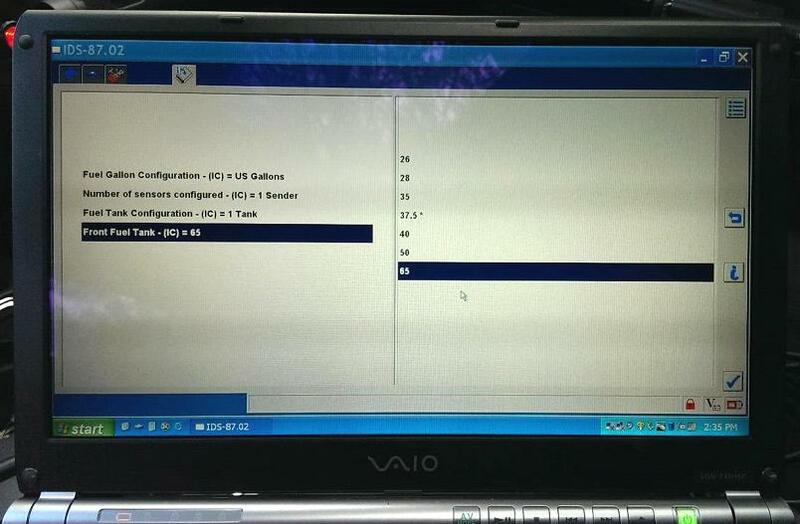 (right) This is a view of the IDS software on the laptop screen with the VCM connected to the truck's computer. You can see the stock setting of 37.5 as well as the new 65 gallon setting being selected which accurately recalibrates the fuel gauge and DTE fuel trip computer. 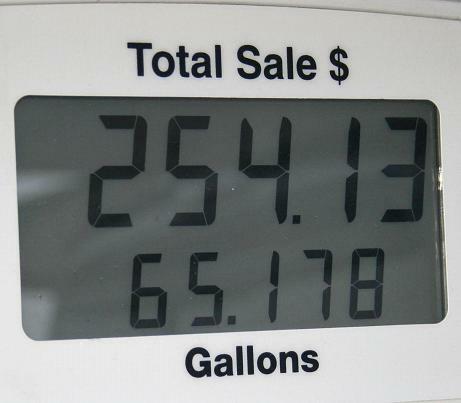 (below) Filling up a full tank of fuel at the pump is not for the faint of heart. This is truly a "Big Boy's Toy". (right) This is a view of the dashboard display after reprogramming the vehicles computer and recalibrating the fuel tank size. The MPG reading was just from in town driving so once I get this out on the open highway and the mileage numbers get up to the normal 20-23 MPG mark I'm not sure if the Distance to Empty display will read up past and into the 4 digit range. This is some serious stuff here, travelers!